(SRS) AIR BAG” and SEAT BELT PRE-TENSIONER” 5, wiring Diagnosis Trouble Diagnosis 5, sQUEAK AND RATTLE TROUBLE DIAGNOSES 7, dUPLICATE THE NOISE AND TEST DRIVE 8. LOCATE THE NOISE AND IDENTIFY THE, generic Squeak Rattle Troubleshooting 9, oVERHEAD CONSOLE (FRONT AND REAR) 10, removal and Installation Hood Assembly 15. Removal and Installation of Hood Lock Control 16, component Parts and Harness Connector Location 18, wITHOUT AUTOMATIC SLIDING DOOR SYSTEM AND AUTOMATIC BACK DOOR SYSTEM 19, aND AUTOMATIC BACK DOOR SYSTEM 20. WITHOUT AUTOMATIC SLIDING DOOR SYSTEM AND AUTOMATIC BACK DOOR SYSTEM 22, wITH RIGHT AND LEFT HAND AUTOMATIC, wiring Diagram — D/LOCK — 25, wITHOUT AUTOMATIC SLIDING DOOR SYSTEM AND AUTOMATIC BACK DOOR SYSTEM 25. WITH RIGHT AND LEFT HAND AUTO SLIDE, terminals and Reference Value BCM 37, bCM Power Supply and Ground Circuit Check 40, door Switch Check (Without Automatic Back Door. Door Switch Check (With Automatic Back Door System) 43, front Door Lock Assembly LH (Actuator) Check 48, front Door Lock Actuator RH Check 50, door Lock Actuator Check (Sliding Door) 51. 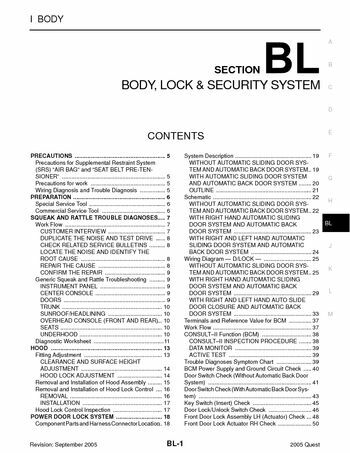 Front Door Lock Assembly LH (Key Cylinder Switch), component Parts and Harness Connector Location 54, wiring Diagram — KEYLES — 62, terminals and Reference Value BCM 65. Terminals and Reference Value IPDM E/R 66, bCM POWER SUPPLY AND GROUND CIRCUIT, door Switch Check (With Automatic Back Door System) 76, keyfob Battery Function Check 78. Remote Keyless Entry Receiver System Check 79, check Map Lamp Ignition Key Illumination, kEYFOB ID SET UP WITH CONSULT-II 83, kEYFOB ID SET UP WITHOUT CONSULT-II 85. VEHICLE SECURITY (THEFT WARNING) SYSTEM 87, component Parts and Harness Connector Location 87, pOWER SUPPLY AND GROUND CIRCUIT 88, iNITIAL CONDITION TO ACTIVATE THE SYSTEM 89. VEHICLE SECURITY SYSTEM ALARM OPERATION 89, wiring Diagram — VEHSEC — 92, terminals and Reference Value BCM97, terminals and Reference Value IPDM E/R97. Component Parts and Harness Connector Location 112, wITH RIGHT HAND SLIDE DOOR AUTO CLOSURE SYSTEM 121, wITH RIGHT AND LEFT HAND SLIDE DOOR, wiring Diagram — S/CLOS — 124. WITH RIGHT HAND SLIDE DOOR AUTO CLOSURE SYSTEM 124, terminals and Reference Value Sliding Door, terminals and Reference Value BCM 144, auto Sliding Door Power Supply Ground Circuit. Automatic Door Main Switch System Inspection, sliding Door Open/Close Switch System Inspection, sliding Door Motor System Inspection 150.